City’s plan to redevelop urban renewal area in the Lower East Side would include 1.65 million sq.ft. of new development across nine City-owned sites. On August 22, 2012, the City Planning Commission approved the New York City Economic Development Corporation’s 1.65 million-square-foot, 900-unit Seward Park Mixed-Use Development Project in Manhattan’s Lower East Side. The project site consists of nine City-owned lots on the north and south sides of Delancey Street between Ludlow and Clinton Streets. Three lots are north of Delancey Street and include the Essex Street Market building (Site 9) and two low-rise commercial properties (Sites 8 and 10). The remaining six lots are on the south side of Delancey Street bounded by Ludlow and Clinton Streets and make up the proposed Large-Scale General Development. The lots below Delancey Street and east of Essex Street are within the 1965-created Seward Park Extension Urban Renewal Area (SPEURA) and used primarily for parking. Although the City redeveloped portions of SPEURA in the 1980s, the attempts to redevelop the project site were ultimately unsuccessful. The SPEURA designation expired in 2005, and in 2008 the City and local community entered into a long-term planning process that culminated in the current proposal. 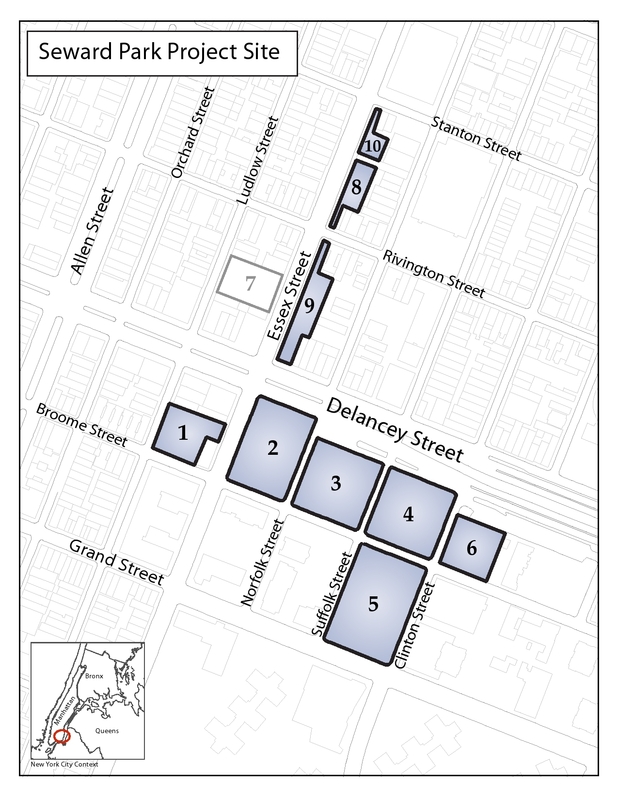 EDC’s proposal envisions six new buildings below Delancey. The proposed Large-Scale General Development site plan would allow the buildings at the southeast corner of Delancey and Essex Streets (Site 2), and the southwest corner of Delancey and Clinton Streets (Site 4) to be built up to 24 stories. The remaining four buildings (Sites 1, 3, 5 and 6) would be limited to 14 stories. The project would include 500 underground public parking spaces. Future development of the three lots north of Delancey would be controlled by the underlying C4-4A zoning regulations. EDC’s vision includes the relocation of the Essex Street Market to Site 2, across the street from its current home. The Market, however, would not be relocated until after completion of the new space. The new space would accommodate nearly twice the amount of vendors as the existing market, and EDC would give existing vendors the first opportunity to relocate. Sixty percent of the project’s floor area would be allocated to residential uses, with the remaining 40 percent dedicated to commercial and community facility uses. The proposal’s residential component includes setting aside half of the 900 dwelling units for low-, moderate-, and middle-income tenants. If the proposal is approved, the City, with input from Manhattan Community Board 3, would issue a formal request for proposals to select a developer (or developers) for the project and identify the exact mix of uses and specific design elements for each site. At its public hearing in July 2012, the Planning Commission heard testimony from residents both in support of and in opposition to the project. Representatives from CB 3 noted that the proposal was the result of three-and-half years of community planning, which included numerous open meetings and a large town hall-style event. CB 3 unanimously approved the proposal, but included a host of recommendations, including that the City require that each building provide a mix of affordable apartments, that all subsidized housing be permanently affordable, and that the City continue to consult with the community during the development process. Manhattan Borough President Scott M. Stringer supported the project, but offered several recommendations. Brian Cook, representing Stringer at the hearing, urged the City to continue working with the local community, and recommended, among other things, that the City reserve space on the site for a future public school. Opponents of the plan, including representatives from the Chinese Staff and Workers’ Association and Good Old Lower East Side argued that the project’s entire housing component should be permanently affordable for low-income residents. Several residents and business owners reiterated the call for more low-income housing, and also claimed that the City’s outreach efforts had been inadequate. The Planning Commission unanimously approved the proposal, noting that the project site is the largest development site in Manhattan south of 96th Street. Noting that previous attempts to redevelop the area had failed, the Planning Commission praised CB 3 and the City for working for more than four years to develop a “solid consensus” on a balanced set of project goals. The Planning Commission found that the proposal established an appropriate framework with a reasonable amount of design flexibility. The proposal still needs to be reviewed by the City Council. CPC: Seward Park (C 120226 ZMM – rezoning); (C 120156 MMM – City map change); (N 120227 ZRM – text amendment); (C 120228 ZSM – special permit); (C 120229 ZSM – special permit); (N 120230 ZAM – authorization); (C 120231 ZSM – special permit); (C 120233 ZSM – special permit); (C 120234 ZSM – special permit); (C 120235 ZSM – special permit); (N 120236 HAM – UDAAP); (C 120237 PQM – acquisition); (C 120245 PPM – disposition) (August 22, 2012).